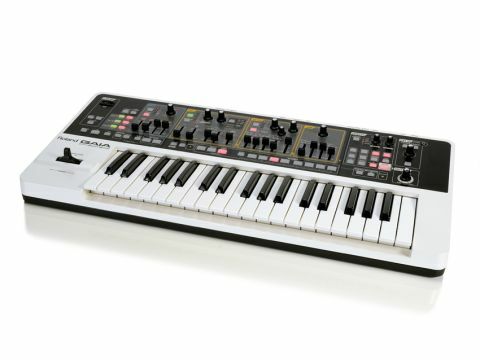 Playability, value for money and solid sound quality make this retro-modern synth a winner. Made for hands-on playability with simple and intuitive patch creation. No LCD screen because there are no menus. Powerful (virtual) analogue sound. Some of the presets don't exploit its potential. Headphones cut the master outs. Synthesizer trends regularly flip-flop between radical innovation and retrogression with each pendulum swing producing a host of hybrids. Roland has had its fair share of winners and losers in this field but with the Gaia SH-01, a virtual analogue synth, it is (at last) looking to produce a hybrid winner with thoroughbred credentials. Just look at it. No LCD screen, a dedicated knob or fader for every purpose. The Gaia SH-01 is a chip off the old analogue block and, while the synthesis is digital - or 'virtual analogue' if you prefer - it allows for a range of functions that are unavailable in analogue electronics at anything near this price ('street' at just under £500). With the quality of digital synthesis creeping ever closer to the analogue standard Roland is finally on target to make a synth worthy of the SH badge of honour. 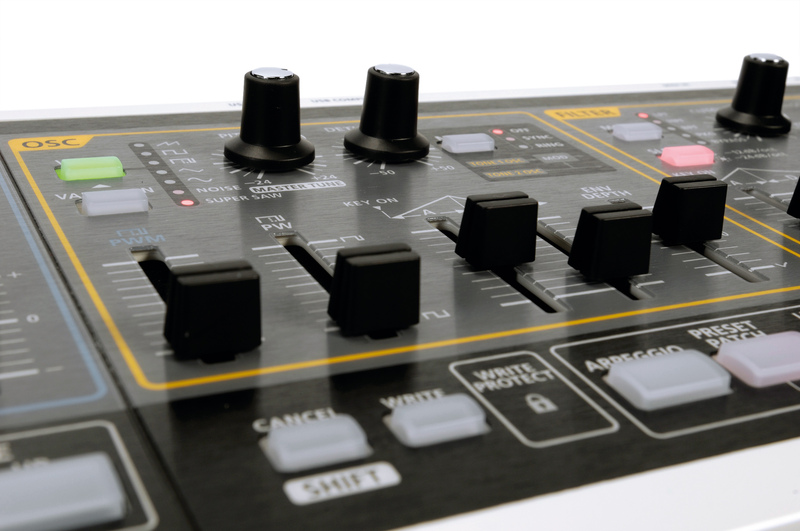 The black and white design is smart and crisp while the controls and markings blend the Roland analogue synths of the past with a more modern aesthetic. It's worth pointing out that the unit is remarkably lightweight, while the plastic casing seems robust enough for live performance. Nearly every parameter has its own form of visual feedback, from the slider and knob positions to the backlit buttons, and this makes patch creation and editing as simple and immediate as on any analogue synth. In fact, the layout is so 'left to right' intuitive that the user can get straight into tweaking and playing the second the Gaia is plugged in. No manual flicking and head scratching necessary. You start on the left with the Tone selection buttons that select and operate the three Tones (effectively three synths, each with its own oscillator, LFO, modulation LFO, filter and amplifier). Tones can be edited singly or together by pressing and holding the appropriate Tone Select buttons. There is also a Tone Copy button to duplicate tone settings to speed up editing and patch creation. "The layout is so 'left to right' intuitive that you can get straight into tweaking and playing the second the Gaia is plugged in." After Tone selection come the LFO controls, followed by the OSC (oscillator) section, the Filter controls and ending with the Amp section. The LFO features six waveforms (triangle, sine, sawtooth, square, S&H and random) with a rotary speed knob, a tempo sync button, flashing speed LED and sliders for the LFO assignment: Fade Time, Pitch Depth, Filter Depth and Amp Depth. The LFO can itself be modulated further by the seemingly invisible Modulation LFO. This extra layer of control comes courtesy of the Modulation lever (ie, the vertical motion of the pitch bender) and, with the help of the SHIFT button has its own waveform and speed and can be assigned to alter any of the LFO parameters. Speaking of the SHIFT button, if something doesn't have a dedicated control then some combination of this and another control will access it. At a patch level the SHIFT button can access two more controls for each effect (as there are only two control dedicated knobs), oscillator panning, modulation LFO assignments, pitch bend ranges and so on. At a global level the SHIFT button accesses (in combination with other controls) system parameters such as master tuning, velocity sensitivity, D-Beam sensitivity, clock sources, MIDI parameters, etc. The Gaia possesses a deceptively deep control system that neither hinders playability by offering too many 'at hand' parameters nor restricts sound manipulation and system integration due to an over simplifi d feature set. Well done Mr Roland. The Amp Depth control also doubles as the Tone pan LFO modulation control when used with SHIFT. For a section that only has one knob, two buttons and four sliders there is a wide range of modulation possibilities available, from the subtly evolving to the out and out crazy. As with all synths, the oscillators are where a lack of quality spells certain doom whatever's going on elsewhere. The SH-01 does not disappoint on this score and provides a healthy selection of waveforms (sawtooth, supersaw, square, triangle, sine, noise and pulse/PWM), each with three variants. Though these are not explained in the literature, these variations possess slightly different harmonic weightings and effectively give you 21 waves to start from. It's great to stack three of the same waveforms (or variations thereof) across the three Tones, especially with the infamous SuperSaw (add detune and panning to taste!). The pitch and detune knobs lead double lives thanks to the SHIFT function where they control the master tuning and oscillator pan position respectively. There is a 'mod' function here that uses Osc 2 to modulate Osc 1 either in Sync mode or as Ring Modulation and two sliders are dedicated to the Pulse/PWM waveform. A pitch envelope is also provided with attack and decay sliders and an envelope depth control. As with the LFO section, this is a comprehensive system that doesn't drown the user in controls and options, and the results are excellent both tonally and creatively. The Filter section consists of three knobs (cutoff, resonance, keys follow +/-), five sliders (ADSR envelope and depth +/-) and two buttons (filter mode and slope). The layout is simple and leaves enough space for the constant tweaking this section will no doubt receive. The four filter modes (LPF, HPF, BPF and Peaking) are available with two slopes, 12dB per octave and 24dB per octave. The filter sounds great in all modes and there is plenty of dynamic shaping to hand with the ADSR envelope. The digital nature of the SH-01 does come to light here more than anywhere as fast filter sweeps, especially at high resonance, can sound a little stepped, but with effects and different filter settings across the multiple tones the stepping is masked. The final Amp section is simply an overall Level knob for the selected Tone(s) and a 4-slider ADSR envelope control which delivers everything from percussive punches to slow attack/long release shapes for ambient pad sounds. The overall output level from the SH-01 is healthy, clean and not limited with regards to frequency, delivering a pleasingly full and punchy tone. The Gaia effects section is simple, easy to use and provides a surprising amount of patch enhancement potential. There are essentially four effects blocks in the chain, though the fixed Low Boost effect (self-explanatory) that comes on the end is technically a fifth. There are three distortion choices including a neat rough and ready Bit Crash effect, plus Flanger, Phaser and Pitch Shifter. Next are various delays, and finally Room, Plate and Hall variation reverbs. With a combination of the two control knobs (Control 1 and Level) and the SHIFT button (accessing Control 2 and 3) this simple effects chain has plenty of scope and all the presets give it a thorough workout. The Tempo Sync, Effects On/Off and Select Control buttons round off this economical and intuitive section. The standard performance controls are all present and correct (portamento, mono/poly switching, octave up/down, transpose, tap tempo, pitch bend/modulation lever) with parameter adjustments just a couple of finger moves away (usually involving the SHIFT button). We particularly appreciate the Key Hold function - a note/chord can be sustained without an external pedal (there is a TRS jack for a sustain/ expression pedal), allowing for a proper two handed tweaking. At the far left of the SH-01 is the D-Beam (light beam) controller which can be assigned to volume, pitch or any other control(s) via the Effects/Assign button. Hit the button, tweak the parameter and - bingo - it's on the D-Beam. The arpeggiator provides 64 preset patterns (easily enough I reckon), while the Phrase Recorder allows for up to eight 'phrases' (ie, internal MIDI note/controller movement recordings) of one to eight bars in length to be recorded, edited (very simply), stored and played back. This is a useful performance tool as well as an excellent way to audition patches for a particular line or riff. "Starting with a blank patch and building it tone by tone is much more fun than trying to untangle the sounds already on board to make them more original." Patch storage is simple, providing 64 user patches alongside the 64 factory presets. It's worth mentioning at this stage the slight cheesiness of the presets on board; there are plenty of Faithless Lite and Basshunter-ready sounds here that rather play down the analogue simplicity and fun to be had. Honestly, starting with a blank patch and building it tone by tone is much more fun than trying to untangle the sounds already on board to make them more original. And you simply don't notice the lack of an LCD screen - this is the most fun synth we've used in a very long time. Patch data backup is available via a USB flash key socket and is a great way to use up those old low MB data keys. This is great. It's a shame the same can't be said of the way the headphone output cuts out the master outs when you plug in phones. Not very 'pro', that. Overall it's the sheer playability and tweakability of the Gaia that means that the user can just dive straight in with the filter sweeps, modulations and effects to make the sound their own. You might be a soft synth master but you just can't beat the physicality and speed of a hardware synthesizer and the Gaia positively begs you to make new sounds as soon as you engage Tone 1. Though borrowing some of its look from the original SH analogue units the Gaia is a thoroughly modern instrument which can produce fat monosynth basses, through screaming leads, to big rave pads and arpeggiated euphoria. It's very much what a performance synth is all about. In regard to whether the Gaia is worthy of its SH branding, we would say 'yes'. Classic analogue synths are always a joy to play and engage with and are yet to be seriously challenged with regard to tone and depth by any digital instrument. That said, their cost and, in many cases, reliability inhibits their mass appeal, and thus 'virtual analogue' is very welcome to plug the gap. With the Gaia SH-01, Roland has made a smart move, creating a flexible, tonally pleasing, infinitely playable and cost-effective synth. Oh yes, and in case that isn't enough, it also has a USB 2.0 port so it can even act as an audio/MIDI interface too. All-in-all, Gaia is great fun and great value. Death to the menu screen!